Marimba from Zero to Eight Mallets ~ A unique and visually spectacular concert or clinic program. Jane plays a solo with 0 mallets, a piece with 1 mallet, and so on up to an 8-mallet finale. Clinic attendees can perform [with 2, 4, or more mallets] for feedback from Jane. Portable Percussionist~ Jane hikes from one concert venue to the next, performing music for "portable" and found instruments. The first Portable Percussionist tour was from Canada to Massachusetts down the Long Trail. See portablepercussionist.blogspot.com for trail reports and live video. Concerti ~ Jane is delighted to perform as a concerto soloist with orchestras or other ensembles. She gave the world premiere performance of Garry Jones's Concertino for Park Bench and Orchestra in 2012. Marimba Ragtime ~ In the 1920s and 1930s -- the early days of radio broadcasting -- the xylophone was one of the most popular instruments on the radio. 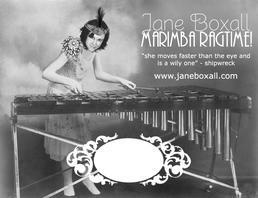 Jane performs the music of Green, Breuer, Joplin and others on a vintage (1926) Deagan xylorimba. Music by Women Composers ~ A program of female-composed music for the marimba, including some of the earliest pieces in the marimba repertoire alongside brand new commissions. The program draws from Jane�s 2008 album Spherical Music. Ricochet Duo ~ A piano-marimba duo committed to fresh music. With pianist Rose Chancler, Jane presents new commissions, early repertoire, and a program of tango and ragtime music. In 2014, Ricochet will premiere the 'Woodswoman Project', a multimedia concert program honouring Anne LaBastille. See ricochetduo.com for details. Kindermarimba ~ Varied programs and presentations for young children, including audience participation through singing, dancing and body percussion. Short marimba pieces in a variety of styles are included alongside marimba-related stories and legends. DRUMarimba ~ Exploring the connections between drumming and marimba playing, Jane performs electroacoustic music for solo marimba with �exploded drum kit�. Jane also offers a drumkit clinic entitled �Postmodern Beats,� which has toured from Massachusetts to Seattle.